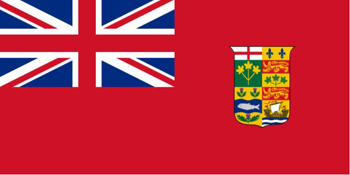 The flag on the left is the Canadian flag in WW1. Canada was still part of the British Empire. 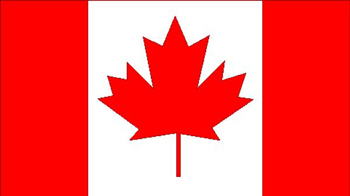 The other is Canada's flag today. The Canadian Connection: When the AIF decided to encourage trench raiding they turned to the Canadians for advice. From 1914 the Canadians had been active in raiding German trenches. Their preferred method was the quiet, creep in, create havoc and then withdraw approach. They were considered to be the experts on trench raids. After the decision, on May 14th, 1916, for the 7th Brigade to carry out the first raid the AIF sought, and were loaned, two experienced Canadian officers, Major Allan Conners and Captain Stanley Kent,who were involved in the training of the Black Anzacs. The following biographies were provided by researcher Owen Cooke from Ottawa. Major Allan De Vere Conners, M.C. Allan De Vere Conners was born 13 March 1887 in Summerside, P.E.I., the son of Peter Allan and Rebecca Whitehead Conners. At the time of his appointment to the Canadian Expeditionary Force (CEF), he gave as his next of kin his sister, Miss Ethel B. Conners at 758 Tremont Street, Summerside. He was 5 feet 9 inches with ruddy complexion, dark blue eyes and brown hair. When the First World War broke out, he was a real estate and oil broker in Calgary, Alberta. He had served five years with the Canadian Militia, three in the infantry and two with the Canadian Army Service Corps (CASC), in which he was appointed Lieutenant 29 May 1913. Conners was formally appointed as Lieutenant to Headquarters Company of the Divisional Train, CASC, on 6 January 1915 on Salisbury Plain, England, although he joined the CEF in Valcartier, Quebec, in August 1914 and went overseas 22 September 1914. He accompanied his unit to France on 1 April 1915. On 29 May 1915 he transferred to the 10th Battalion, CEF, as one of the officers re-building the Battalion after the battles of Second Ypres in the spring of 1915. He served the remainder of his short career with the 10th Battalion. He was promoted Captain 13 November 1915 and became officer commanding “D” Company. He was wounded on 13 December 1915, but apparently remained with his unit. In January 1916 the 10th Battalion discovered that the Germans were putting in machine gun emplacements, strengthening the parapet and improving the trenches opposite them in the Douve sector. The battalion commander proposed a trench raid at a point where a communication trench from Messines joined the front line. Because there was no artillery preparation the raid was delayed for a suitable dark, wet night. The raiders rehearsed their operation on a replica of the enemy positions laid out behind the lines. Captain Conners was the officer in overall charge of the trench raid made by some seventy men on the night of 4-5 February 1916. First, a wire-cutting party of six worked in No Man’s Land for six hours, then an assault party of fifty entered the German lines. They lost the element of surprise when discovered by some thirty Germans. In the ensuing firefight and withdrawal the Canadians lost four dead and seventeen wounded. They had taken eight prisoners, but when they could not be brought back to the Canadian lines, all were shot or bayoneted. Although Conners remained within the Canadian front lines, he controlled the movements of the raiders and, when they were surprised by the Germans, he called down accurate artillery fire to aid their withdrawal. The raid resulted in a number of decorations to the participants, including the first Military Crosses won by the Battalion. On 3 June 1916 the award of the Military Cross to Conners was announced in the London Gazette as part of the King’s birthday honours. No citation was published. From 17-30 June 1916 he was treated for “debility” at no. 1 General Hospital in France. He was promoted Major 18 July 1916. On 27 September 1916 he died of wounds suffered in fighting as part of the Somme battles. He is buried at Warloy-Baillon Communal Cemetery Extension, north-east of Amiens, France. Major Conners’ medals were sent to his sister Ethel at Nopeming Sanatorium, Nopeming, Minn., U.S.A., in 1922. He also had a brother living in Alhambra, California, and a sister in Boston.
. Except as noted, the material for this biography comes from Conners’ Canadian Expeditionary Force personnel file.- Library and Archives Canada (LAC) RG 150 accession 1992-93/166 box 1923. Although the surname is “Conners” on his personnel documents, he signed “Connors” on military reports.- 1st Canadian Division Headquarters, “Operations; Minor (10th C.I. Bn. ), 5-2-16 to 28-2-16; C.R. 1-B-1,” LAC RG 9 III C 3 vol. 4017, folder 34, file 9.
. Commonwealth War Graves Commission (CWGC) certificate - http://www.cwgc.org/search/certificate.aspx?casualty=74205, accessed 18 December 2011.
. Daniel G. Dancocks, Gallant Canadians; the Story of the Tenth Canadian Infantry Battalion, 1914-1919 (Calgary: Calgary Highlanders Regimental Funds Foundation, 1990), p. 71.
. “10th Canadian Infantry Battalion, August 18th 1916,” [officers’ annotated nominal roll], LAC, RG 9 III C 3, vol. 4051, folder 18, file 8.
. David K. Riddle and Donald G. Mitchell, The Military Cross to the Canadian Expeditionary Force, 1915-1921 (Winnipeg: Kirkby-Marlton Press, 1991), p. 67. Stanley Hornsby Kent was born in South Shields, Co. Durham, England, on 25 April 1890, the son of Charles W. and Alice Kent. He became a banker in Calgary, Alberta, was single and an Anglican. While still in England he served in the Northumberland Hussars, Imperial Yeomanry. At the time he joined the Canadian Expeditionary Force (CEF), his parents were living at Milburn House, Newcastle on Tyne, England, and they were later at Clovelly, Windsor Crescent, Whitley Bay, Northumberland. He was 5 feet 8 inches tall, with dark complexion, dark brown hair and blue eyes. He initially was attested into the 19th Alberta Dragoons of the Divisional Cavalry, as a Trooper, at Valcartier, Quebec, on 23 September 1914. He sailed from Quebec City for England aboard SS Montreal on 4 October 1914. In June 1915 he was at Cadet School at General Headquarters in France. On 10 July he transferred from the cavalry to the 10th Battalion, CEF, as a Lieutenant. He reached his new unit on 25 July, one of several new subalterns who would have a major impact on the rebuilding of the Battalion following the losses at the Second Battle of Ypres. As early 30 December Kent was showing his ability to dominate No Man’s Land. In the Douve sector, he and a sergeant spent all day just outside the German wire and brought back information which permitted the artillery to fire onto a German work party. In January 1916 the Battalion discovered that the Germans were putting in machine gun emplacements, strengthening the parapet and improving the trenches opposite. The battalion commander proposed a trench raid at a point where a communication trench from Messines joined the front line. Because there was to be no artillery preparation, the raid was delayed for a suitable dark, wet night. Kent had done a preliminary reconnaissance, twice staying out all day close to the German lines. The raiders rehearsed their operation on a replica of the enemy positions laid out behind the lines. On 4-5 February 1916, Kent led, first, a wire-cutting party of six, then, when the wire was cut after six hours work, led the assault party of fifty into the German lines. They lost the element of surprise when discovered by some thirty Germans. In the ensuing firefight and withdrawal the Canadians lost four dead and seventeen wounded. They had taken eight prisoners, but when they could not be brought back to the Canadian lines, all were shot or bayoneted. Kent was the last man to return, carrying a wounded soldier. The next day, Kent was treated for shell shock, but remained on duty with his battalion. In February-March he was at the Divisional School in the field. Again on the night of 2-3 March, Kent was in No Man’s Land with a patrol which discovered a German listening post, then knocked it out with Mills bombs. In April 1916 the 10th Battalion was back in the trenches of the Ypres Salient. A German mine was discovered only thirty yards from the Battalion’s front line, and it was determined to destroy it by placing an explosive camouflet in No Man’s Land. Again, Kent supervised its explosion. Although it succeeded in destroying the mine, the Battalion lost one killed and six wounded in the subsequent shelling. On the Battalion’s next tour in the line, Kent was out patrolling again, first with three men on 4 May, then with two on 7 May. On 4 July 1916, in the line north of Mount Sorrel, he was hit by five pieces of shrapnel from an exploding whiz-bang, receiving wounds to the right arm, thigh and knee. He walked to the dressing station, then was treated at no. 10 Casualty Clearing Station and no. 7 Stationary Hospital in Boulogne for three days before being evacuated to England aboard the hospital ship Panama. He spent a week at the Imperial Order of the Daughters of the Empire Canadian Red Cross Hospital in London. He convalesced for a month at his parents’ home before reporting to 2nd Canadian Command Depot in Shoreham on 15 August. He returned to France on 8 February 1917, and re-joined the 10th Battalion on 3 March. By this time the Battalion was preparing for the Vimy Ridge offensive. The front for the Battalion’s attack was limited by the largest craters on the ridge, with the area between them heavily wired. On the night of 4-5 April Captain Kent crept into No Man’s Land and reconnoitred the whole of the Battalion front. During the intense artillery preparation for the attack, there was doubt whether the wire on the 10th Battalion front was being cut or just buried. Major-General Sir Arthur Currie, the 1st Canadian Division’s commander, proposed a raid to determine the effect of the barrage. Very early on the morning of 8 April, Kent led three parties of some eighty-five men, under the protection of a box barrage, 150 yards into the German defences. The raid was successful, killing four Germans and bringing back two prisoners. It determined that the wire was not significantly damaged, but it cost five Canadians killed and thirteen wounded. The 10th Battalion pulled out of its forward trenches to allow the divisional heavy artillery to concentrate on this wire before the attack. 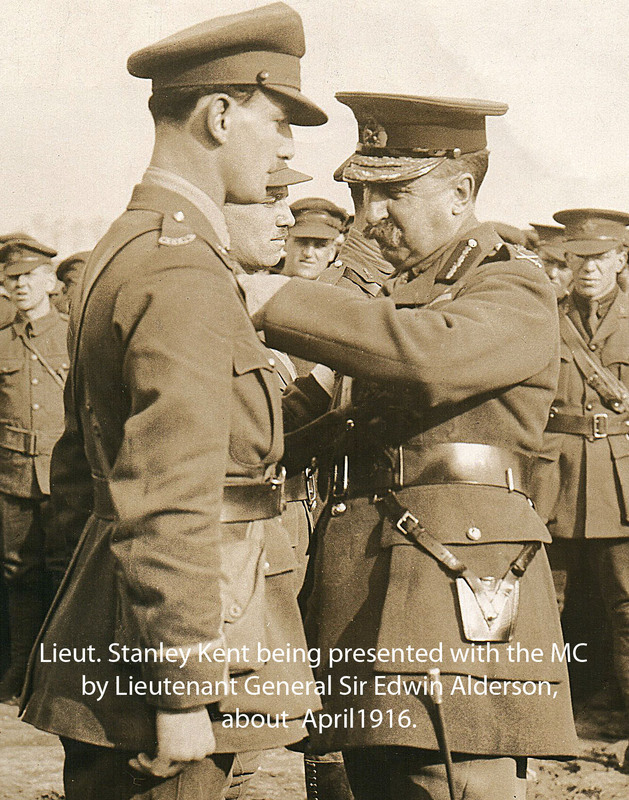 During the initial Vimy Ridge attack, Kent advanced as liaison officer to the 15th Battalion on his unit’s left. On 10 April he became a paid Acting Captain. In the first stages of the battle for Arleux on 28 April 1917, Captain Kent was seriously wounded while guiding troops into the jumping-off trenches. He died of his wounds the next day, 29 April, at no. 30 Casualty Clearing Station. He is buried in the Aubigny Communal Cemetery Extension, Aubigny-en-Artois, north-est of Arras, France. His medals, including the 1914-15 Star, the British War Medal and the Victory Medal were sent to his father, at 46 Grosvenor Pace, Jesmond, Northumberland, England, in 1922. The Cross of Sacrifice had previously gone to his mother.
. Except where noted, this biography has been created from his Canadian Expeditionary Force personnel file, Library and Archives Canada (LAC), RG 150 accession 1992-1993/166 box 5104.
. Daniel G. Dancocks, Gallant Canadians; the Story of the Tenth Canadian Infantry Battalion, 1914-1919 (Calgary: Calgary Highlanders Regimental Funds Foundation, 1990), p. 59.
. Ibid., p. 70-71; 1st Canadian Division Headquarters, “Operations; Minor (10th C.I. Bn. ), 5-2-16 to 28-2-16; C.R. 1-B-1,” LAC RG 9 III C 3 vol. 4017, folder 34, file 9.
. David K. Riddle and Donald G. Mitchell, The Military Cross to the Canadian Expeditionary Force, 1915-1921 (Winnipeg: Kirkby-Marlton Press, 1991), p. 170.
. Riddle and Mitchell, p. 170.
. Commonwealth War Graves Commission (CWGC) certificate - http://www.cwgc.org/search/certificate.aspx?casualty=52506, accessed 18 December 2011.